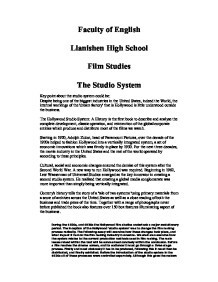 Faculty of English Llanishen High School Film Studies The Studio System Key point about the studio system could be: Despite being one of the biggest industries in the United States, indeed the World, the internal workings of the 'dream factory' that is Hollywood is little understood outside the business. The Hollywood Studio System: A History is the first book to describe and analyse the complete development, classic operation, and reinvention of the global corporate entities which produce and distribute most of the films we watch. Starting in 1920, Adolph Zukor, head of Paramount Pictures, over the decade of the 1920s helped to fashion Hollywood into a vertically integrated system, a set of economic innovations which was firmly in place by 1930. For the next three decades, the movie industry in the United States and the rest of the world operated by according to these principles. Cultural, social and economic changes ensured the demise of this system after the Second World War. A new way to run Hollywood was required. Beginning in 1962, Lew Wasserman of Universal Studios emerged as the key innovator in creating a second studio system. He realized that creating a global media conglomerate was more important than simply being vertically integrated. Gomery's history tells the story of a 'tale of two systems 'using primary materials from a score of archives across the United States as well as a close reading of both the business and trade press of the time. Together with a range of photographs never before published the book also features over 150 box features illuminating aspect of the business . During the 1920s, and 1930s the Hollywood film studios undertook a major evolutionary period. The inception of the Hollywood 'studio system' was to change the film making process radically. The following essay will examine how these changes took place, and what impact it had on the film making industry in America. ...read more. OPEC VS. Hollywood : Issues of Price Fixing, Control of Distribution What is Vertical Integration? Merging companies operating at different stages in the production process, for instance, a theatre chain merging with a production studio. A vertically integrated film company will own and control all levels of one industry. What are the Three Keys to Hollywood's Oligopoly? * Production * Distribution * Exhibition 1930-1948: A Mature Oligopoly ��The Five Majors or "The Big Five" : Companies integrating their control of production, distribution, and exhibition�� * Paramount (Adolph Zukor, Ernst Lubitsch) o First of the Majors to integrate. o Stars famous for their wit (Marx Brothers) and sexual allure (Clara Bow, Mae West, and Marlene Dietrich) o Directors given more creative control o Historical Sidepoint: Before Adolph Zukor took control of Paramount at the behest of the Board, the sitting president Hodkinson spoke out against vertical integration saying it would be harmful to independent production to have production, distribution, and exhibition housed under one roof. o Throughout the 30s and 40s, no studio held as strong a ties to the world of theatre exhibition. Through a merger with Balaban and Katz and Zukor's Famous Players-Lasky, the Paramount Publix grew to control more than one-thousand theatres with a strong base in the South and Midwest. * Loew's/ MGM (Louis Mayer and Irving Thalberg) o MGM was the largest of 124 subsidiaries of Loew's Inc. According to an article in Fortune in 1932, MGM employed 62 writers, 18 directors, and a legion of stars not to mention holdings including: about 2 million dollars worth of antique furniture, 22 sound stages, 22 projection rooms, and a greenhouse devoted to the growing of ferns. o Boasting "More Stars than Are in Heaven," MGM assembled a stable of stars with an emphasis on finesse and glamor o Similarly, the look of MGM films were polished and glossy. Throughout the 30s, it was considered the most successful of the Big Five. ...read more. Two-Color and Three-Color (Full-Color) Technicolor Development: One of the first 'color' films was Thomas Edison's hand-tinted short Annabell's Butterfly Dance. Two-color (red and green) feature films were the first color films produced, including the first two-color feature film The Toll of the Sea, and then better-known films such as Stage Struck (1925) and The Black Pirate (1926). It would take the development of a new three-color camera, in 1932, to usher in true full-color Technicolor. The first film (a short) in three-color Technicolor was Walt Disney's animated talkie Flowers and Trees (1932) in the Silly Symphony series. [However, others claim that the first-ever color cartoon was Ted Eschbaugh's bizarre Goofy Goat Antics (1931).] In the next year, Disney also released the colorful animation - The Three Little Pigs (1933). In 1934, the first full-color, live-action short was released - La Cucaracha (1934). Hollywood's first full-length feature film photographed entirely in three-strip Technicolor was Rouben Mamoulian's Becky Sharp (1935) - an adaptation of English novelist William Makepeace Thackeray's Napoleonic-era novel Vanity Fair. The first musical in full-color Technicolor was Dancing Pirate (1936). And the first outdoor drama filmed in full-color was The Trail of the Lonesome Pine (1936). In the late 30s, two beloved films, The Wizard of Oz (1939) and Gone with the Wind (1939), were expensively produced with Technicolor - what would the Wizard of Oz (with ruby slippers and a yellow brick road) be without color? And the trend would continue into the next decade in classic MGM musicals such as Meet Me in St. Louis (1944) and Easter Parade (1948). Special-effects processes were advanced by the late 1930s, making it possible for many more films to be shot on sets rather than on-location (e.g., The Hurricane (1937) and Captains Courageous (1937).) In 1937, the Disney-produced Snow White and the Seven Dwarfs (1937) was the first feature-length animated film - a milestone. The colorful Grimm fairy tale was premiered by Walt Disney Studios - becoming fast known for pioneering sophisticated animation. ...read more. The personalities of the characters can be explored by stage directions. For example, '(With Malken's pop-gun) Loads it, points it and pops it at Miss Y who looks momentarily startled' Here, Mrs X is striving for a reaction and attention from Miss Y.
as a time to celebrate what is satisfactory and for the future of the Yorlahs and their successful son. Both hope and despair can be contagious, and Andy's hope over the film started to rub off on the other inmates. For example Tommy, he appears to be a no hoper but manages, with Andy's help achieved a high school diploma. Phyllis also plays with her wedding ring throughout her conversation with Walter, which hints to the audience that her marriage is loose, unstable and she is wants to be rid of it. Another visual motif of film noir is seen when Phyllis stands and begins to pace up and down, this is her huge and distorted shadow behind her. He is the most secretive of the three and keeps the secret about his wife and son to himself until the very last moment. In one scene he is walking through the night in the rain and Elliott uses this scene to show the audience how Mitzi is feeling.